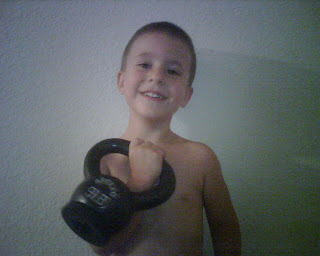 Kettlebells can be integrated into any fitness program. You can train them on the same day with your other lifts and activities or you can designate them to their own day. In my training they are exclusive based on my goals. Before I made the goal I currently have I used to integrate them into the core of my program. I still train all my clients in this same way. Regardless if you use KBs or other training methods you can still over-train your body. Recovery is key. Nutrition is paramount. Adequate sleep is vital. Here is what I did the past couple days in my Boot Camp classes. You will see both K-bells and other movements right in the workout. What I display here is only the core working sets of the 45 min. session. This excludes the warm-up, mobility drills as well as cooldown which includes abs and synergy stretch. These are all extremely important to training. If you are not properly warming up with mobility drills and cooling down with yoga type stretches then you can never achieve you true potential and potentially can open up the door for future injury. I have the clients perform the circuit with the working set of seconds followed by the rest set of seconds. Then after each round we take about a minute or two to recover before beginning the next round. If your rest set is too "long" then you need to work harder during your working set. As you can see there are many bodyweight movements as well as non-traditional KB movements. Of course feel free to experiment on your own. I'll be curious to see what you come up with. Comment here and let us know! I hope this info helps. Coming soon I will be blogging about the Anatomy of Basic Program Design. Keep stopping by and please let me know your thoughts.